All the recipes are now split into their own pages. They are listed on the side bar at the right. The recipes available are listed on this page here but the menu is not a clickable link yet. I am still working out how to do that. This web site offers me a great way to make an easy web site but I am limited on the number of pages I can have so I am experimenting with linking a blog and using it as a recipe book and comments place. It also has better indexing. Green Tomato Chutney The best way I know to use up unripe tomatoes. I will be looking for more recipes this week, I'll let you know if I find a good one. 2lb green tomatoes 1lb of cooking apples 1lb of onions 500ml vinegar, (old recipes use malt vinegar, more recent recipes tend to opt for cider or white wine vinegar) 120z of sugar (I prefer soft brown sugar but see what you have the in cupboard) A good handfull of dried fruit (I like dates chopped small) 1 tsp cumin seeds 1tsp coriander seeds 1 tsp chilli flakes (optional) 2 tsp ground ginger At the start, apple is in large chunks because it has come out of the freezer pre-chopped. Chutney making is easy. The secret is to spend time at the start chopping all your ingredients as small as you have the patience for. No matter how small it looks on your chopping board I can guarantee that it will look much bigger in your sandwich. Finely chop all of the ingredients that need chopping. Put everything into a large saucepan. Heat gently and stir until all of the sugar is dissolved. Then bring up the temperature and give it a good boil. You know when it is done when you can draw a wooden spoon across the bottom of the pan and see the bottom briefly. Warning - chutney burns very easily at this stage and there is nothing so persistent and stinky as that of burnt chutney. You will be smelling it for days. So even though it seems like your chutney is taking ages, and it may well take ages, do no be tempted to wander off and leave it on the heat for even a few minutes. It doesn't need constant stiring but it should be watched. Once cooked you need to pot it up into hot, sterilised jam jars. Try and leave it for a few weeks to even 3 months to let the flavours develop before you eat it. A note on ingredients Please don't worry if you don't have the exact ingredients. There is a lot of scope for changing. 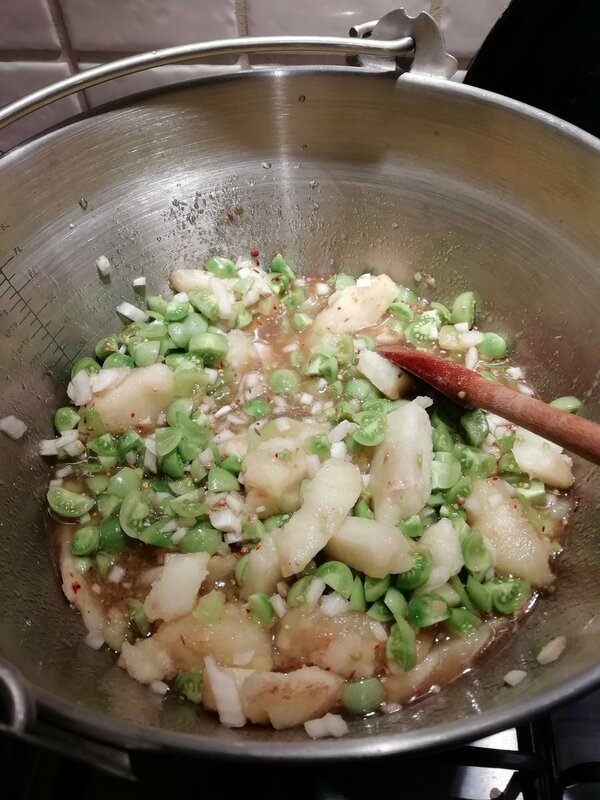 The earliest chutney recipe I have is from a historic cook book and that one uses honey and white wine instead of vinegar and sugar and the main veg is turnips! It tastes a lot better than it sounds. Mix and match your ingredients, swap apples for pears, try other veg, use your favourite spices. It is blackberry time again when lots of people are tempted to make jam. Making jam is always a good idea and not something to be frightened off. The most common question I get asked is why a batch of jam went “wrong.” My answer is always pretty much the same. Unless you wandered off, forgot your jam and came back to a blackened, burnt, solid lump of jam toffee (and a tricky washing up task) then your jam probably did not go wrong. For every "mistake" there is a perfectly good classification of preserve to rescue the day. Just make sure that when you venture into the kitchen feeling like a domestic goddess ready to take on the world that you don't actually announce that you are going to make jam. Tell them you are preserving and once you have finished and are admiring the fruits of your labour, decide what it is you have made. Conserve A conserve is runny jam, often described as loose set with larger pieces of fruit. If your jam doesn’t set over night, bung the jars in the freezer where they will keep pretty much for years. When you need one, take it out and serve your loose set, conserve with pride drizzled over scones and cream. So much easier than trying to spread a set jam over your cream tea. Sauces If it is really runny then whizz it up in the blender and pour your artisan coolie over vanilla ice cream for a divine dessert. The colours are simply stunning and if you heat the coolie as well the taste is amazing. If you are feeling very adventurous then you could gently fry and onion, add a splash of vinegar and some your very runny jam and whizz in the processor to make an interesting sauce for meat. Fruit butters If, when you open you jar of jam, you find that it has set quite hard and is difficult to spread the you have made a butter. Fruit butters sometimes contain actual butter but not always. They tend to have smaller pieces of fruit so make an issue of wanting to better mix the flavours. These would make a good filling for jam tarts or baked puddings. Fruit cheeses If you need a knife to release your jam from the jar then congratulations, you have made a fruit cheese. Carefully cut the jam out of the jar in a neat cylinder and slice thinly. Serve the sliced preserve with British cheeses and a range of crackers for a top notch cheese board. Remember, with all of these, do not tell anyone that your jam went wrong!